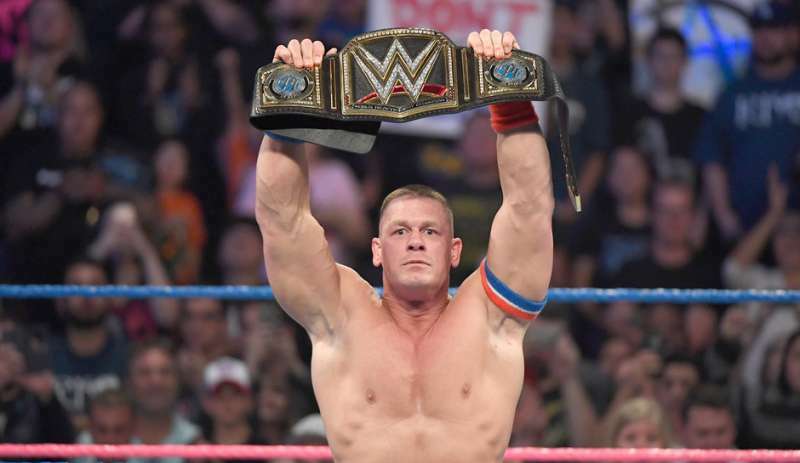 According to a recent report from wweleaks.org, the former 16-time World Champion John Cena may be the one to dethrone the ‘Modern Day Maharaja’ and win the WWE Championship for a record 17th time. At the latest Smackdown-exclusive pay-per-view Backlash, Jinder Mahal defeated Randy Orton to win the WWE Championship for the first time in his career. John Cena, on the other hand, will return to SmackDown on July 4th. Wweleaks.org had previously reported that either Baron Corbin or John Cena may turn out to be the next WWE Champion after Jinder Mahal. However, Corbin is also a betting odd favourite to win this year’s Money in the Bank contract. So it is unlikely that Corbin being a ‘heel’ will be cashing in on another ‘heel’, the current WWE Champion Jinder Mahal. Hence, it is evident that a babyface character will be defeating Mahal and John Cena may be chosen as the one to do so. Wweleaks.org also provided the betting odds, which currently favour Cena. Randy Orton, AJ Styles, Baron Corbin are following the 16-time WWE Champion in this betting odds list to determine the next Champion after Jinder Mahal. John Cena is set to return on the July 4th edition of Smackdown Live. As for Mahal, he will be defending the WWE Championship against Randy Orton at the upcoming Money in the Bank pay-per-view. The crowning of Jinder Mahal as the WWE Champion has generated a buzz throughout the pro-wrestling industry. Also, Mahal's victory finally ended the stale Championship reign of Orton, so not many people are too mad about it. John Cena is yet to receive his rematch for the WWE Championship and I just hope that they don't provide him that rematch on the very day of his Smackdown return. The decision to put the title on Jinder Mahal has been fruitful as of now and it may harm both Mahal and WWE if they abruptly end the title run of "The Modern Day Maharaja'.